I have never meet a cinnamon roll I didn’t like. 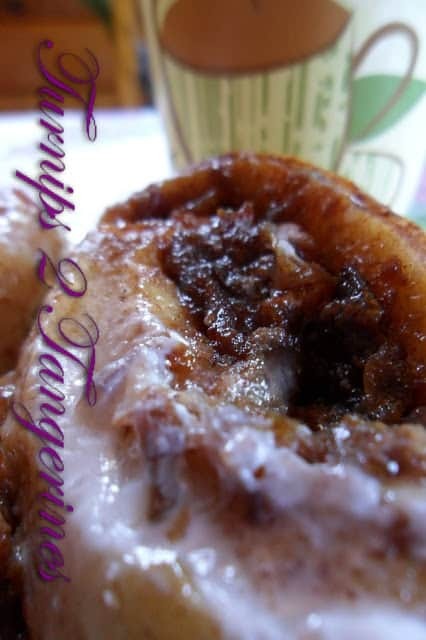 Sourdough Cinnamon Rolls are sweet and gooey but they also have a nice tangy flavor from the sourdough. I have made this recipe many times before with wonderful results. This time I wanted to try something different so I made a cherry date filling. The filling is made up of; dried cherries, chopped dates and a jigger or two of Brandy. Sourdough and cinnamon rolls are meant for each other. Sourdough cherry date cinnamon rolls turned out fantastic. 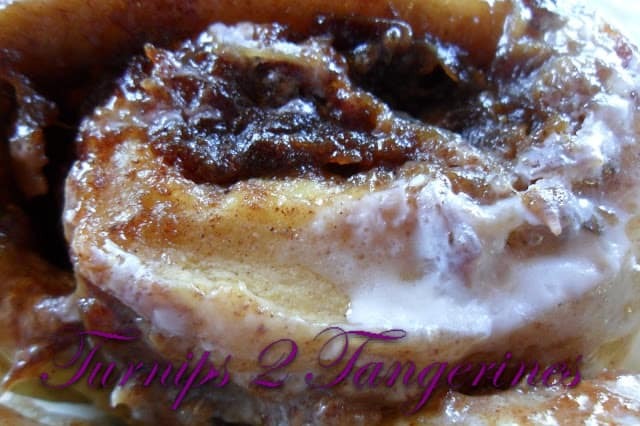 Wonderfully sweet, nice and tangy, and ooey, gooey from the filling. The glaze added yet another layer of yum. The key to good results is to make sure your sourdough starter is nice and active.This will result in cinnamon rolls that are light and airy. If you and your family loves to sink their teeth into a cinnamon roll as much as mine does, get out your sourdough starter and get it nice and active, (nice and bubbly) get in the kitchen and start baking. In a small saucepan combine chopped dates, dried chopped cherries, sugar, salt, water and brandy, if using. Bring to a boil, reduce heat and simmer uncovered for 10 minutes or until dates and cherries are very soft and mixture has thickened. Set aside to cool. Transfer mixture to a small bowl when cool and refrigerate overnight. Take mixture out of refrigerator and allow to come to room temperature before using as filling in sourdough cinnamon rolls. Measure out stirred down sourdough starter into a large bowl. Add milk, vanilla extract, melted butter, salt and 2 cups flour. Stir/knead this together to make a very sticky dough. Add up to 1 cup more flour if needed. Turn out onto a floured surface and knead by hand. Sprinkle in the baking soda and make sure it is thoroughly incorporated. Roll dough into a ball and place it in the bottom of a greased bowl. Cover the bowl with plastic wrap and place in a warm area to rise. This rise should take 2 to 3 hours. The dough should double in size. When the dough has risen, turn it out onto a floured surface. Pressing all the air bubbles out as you go. Roll the dough into a rectangle, roughly 9 x 18. Mix together sugar and ground cinnamon. Brush the rolled dough with 2 tablespoons melted butter. Sprinkle with 1/2 of the cinnamon/sugar mixture. Spread cherry/date filling over cinnamon/sugar mixture. Sprinkle with rest of cinnamon/sugar mixture. Starting on one of the long sides, roll the dough into a long log. Slice log into 12 rounds and place rounds, cut side down in buttered glass 2 quart baking dish. Cover with plastic wrap and let rise for 2 hours or until doubled in size. Bake rolls at 350º for 20 minutes and top is golden brown. Pour glaze over rolls in pan while rolls are still hot. Here is a super sourdough bread recipe you won’t be able to get enough of. Cinnamon Raisin Sourdough Bread. 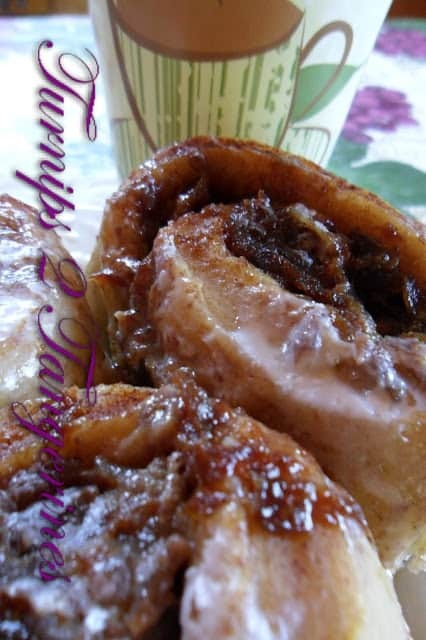 Your Cherry Date Cinnamon Rolls look wonderful and I sure would love to have one. Thank you so much for sharing with Full Plate Thursday and have a great week. I love where you went with the filling! They sound sweet and healthy! 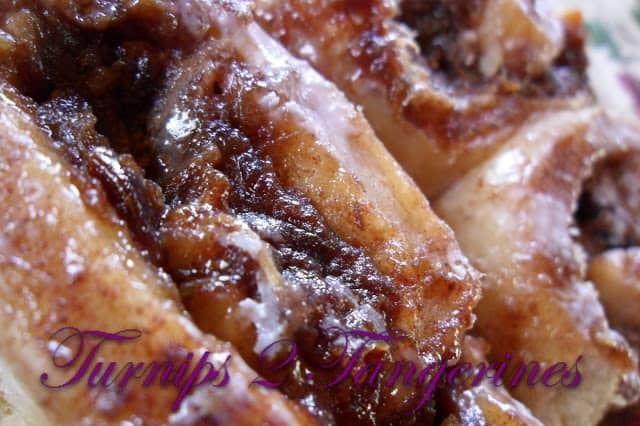 Boozy-fruity-cinnamon rolls? Well, OK, fine, twist my rubber arm – these sounds wonderful! I guess we all had trouble with the Linky tool today. I realised what the problem was when I clicked on the "new" way to add a link and say that it specified the "www". Anyway, love this filling! I go for any dessert with booze. Love the sound of that filling. Yum! Glad you got your link fixed! I like the sound of dates and cherries. My rolls failed, but your recipe was recommended by a fellow Sourdough Surprises baker so I'm going to try it. I love cinnamon rolls, your looks absolutely scrumptious 🙂 These would be perfect for a weekend breakfast! Mmmn! That filling sounds delicious! I saw on another post that you had trouble with getting the link entered. Mine didn't work the first time either. I discovered that I had left the www off of the sourdough surprises link in my post. Once I added that to the link url, the Linkz tool accepted my post. Hope this helps! YUM! These look awesome! Love the fun filling, too!! You said you had trouble getting hte links tool to work – make sure that your back link is for the full http://www.sourdoughsurprises.blogspot.com (you need both the "www." and the ".com") Hope that helps! if not, email us!